Welcome to The Skulls of Wrath Show. We're back doing the online radio show thing. Makes more sense, dunnit? I mean, I came from radio after all. (A: Ace of Spades. 1980.) Fast Eddie Clarke, the last surviving member of the classic Motorhead lineup, passed 10th January 2018. R.I.P. Corrosion of Conformity- The Luddite. New album- “No Cross No Crown” out now & the band seem to be on tour with Black Label Society across America. I mean, around since the early 80’s, 10 studio albums now, at least, you know- everyone knows these guys, no brainer. Self titled, debut album, out now! In this episode I feature the full / stand alone interview with Beast In Black guitarist and mastermind, Anton Kabanen. Fans of Finnish Heavy / Power metal monsters; Battlebeast- or certainly their first 3 albums, might be familiar with the sound/ feel etc of Beast in Black as Anton Kabanen also headed up the creative approach there as well. I am a huge fan of Antons work; the power, energy and all the other elements he brings together makes for an easy transition into my favoured music collection. Oh, and I'm not even familiar with one of the major (non-music) inspirations, Japanese Anime- that is to say, I'm potentially missing certain contexts of much of the lyrical content, yet I can still thoroughly enjoy the music. Welcome to Skulls of Wrath Podcast #3. 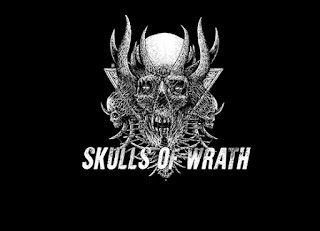 The Skulls of Wrath Podcast #3 featuring interview with Anton Kabanen, guitarist and mastermind behind Finish Power Metal band, Beast In Black. AND I also mention something about a new E.P from Canadian band, The Order of Chaos. Beast in Black: "Blind and Frozen"
To kick things off, I made something similar to the so-called Reaction type videos for youtube. There's a little more to it, if you stick around until the end.